Fr. Henri Le Floch, rector of the seminary from 1904 to 1927, whose position was rather similar to Action Française, though he did not preach Charles Maurras to the seminarians but rather presented to them a commentary on the encyclicals of all the popes from, from 1738 to 1925, incessantly condemned Freemasonry, Liberalism and modern errors, not because they liked to condemned, but to save Christendom and the Church herself. "You enter into the history of the Church"
The Holy Ghost Fathers founded this seminary in 1853 and formed there, during 156 years, some 4,800 ecclesiastical students, seminarians, and young priests from every French diocese and various countries throughout the world. 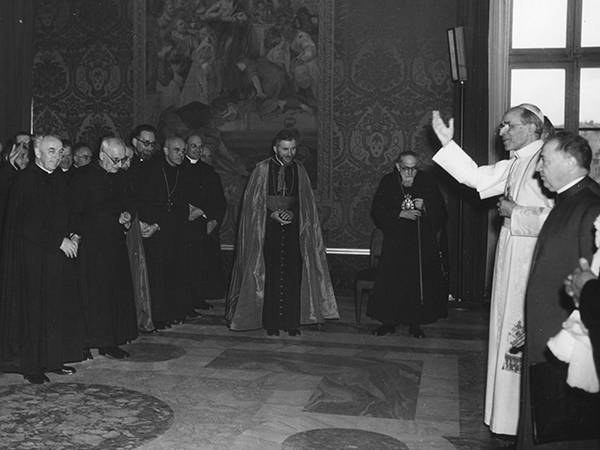 Around 60 bishops, including Archbishop Lefebvre, come from the French Seminary. "The liberal Catholics convey the liberal errors to the interior of the Church and in the associations which are still a little bit Catholic. It is very instructive to re-read the teachings of the Popes on this subject and to ponder the vigor of their condemnations."